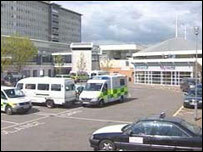 Wales' leading hospital was forced to postpone surgery after new arrangements meant staff could not park their cars. Workers at the University Hospital of Wales in Cardiff described the situation as "chaos" on the first morning of a new car parking plan. Hospital workers used to use the site's privately run multi-storey car park but staff parking areas have been cut under new arrangements. Hundreds of staff were unable to find space to park their cars, causing delays in getting into work on Monday. A heart operation had to be postponed as a result. One member of staff - who did not want to be named - described the situation as "unbearable". "I arrived on the site at 0820 GMT and at 0840 GMT I was going round in circles," he said. "At 0910 GMT it was just gridlock. "In desperation I went to the multi-storey car park where I was threatened with a £19 bill for parking there for the day. "I managed to persuade them to let me there for £1.90 for the day, but I am really worried about what is going to happen tomorrow. "Everyone was affected and it was absolute chaos - people were just driving around looking for spaces even though there were none. "I know that some people just went home because they couldn't park anywhere," he said. He said that he had concerns of how the hospital would have coped had there been an early morning major incident. "There is a real health and safety issue because of this," he said. "Some of the departments only had one member of staff in at 0900 GMT because of the problem. "If there had been a major incident, I just don't think there would have been enough people to cope with it. "It was absolutely chaotic and a total disaster. Cardiff and Vale NHS trust, which runs the hospital, has apologised to staff and patients and said they are reviewing the situation. "Cardiff and Vale NHS Trust would like to apologise to patients and staff who experienced problems parking at the University Hospital of Wales this morning," said a spokesman for the trust. "Today was the first day of the new car parking arrangements for staff who are eligible to park on site and involved the use of new permits for designated parking areas. The changes had been communicated to staff well in advance, according to the spokesman. "Clearly though, there were teething problems this morning until approximately 0930 GMT, which resulted in some staff not being able to park. "Unfortunately, one operation had to be postponed as a result of the disruption, but overall the impact on patients has been very limited. The spokesman added the trust was reviewing events - with the car parking provider APCOA - to see what lessons could be learned.